Journey to one of the Seven Wonders of the World on this day tour from Las Vegas. After hotel pick-up from most hotels on the Strip, you'll head out to the South Rim - the most beautiful part of the Grand Canyon. Upon arrival at the canyon, you will have three hours of free time to explore the area and your guide will provide you with some suggested itineraries to help maximize your time here. Continental breakfast is included as well as a deli-style lunch. After arriving by bus at the Grand Canyon National Park's South Rim, your tour guide will brief you on the highlights of the Grand Canyon so you can make the most of your time here. You will have three (3) hours of free time to explore this wonder of the world at your own pace. Your deli-style lunch can be taken with you to enjoy at one of the lookout points. 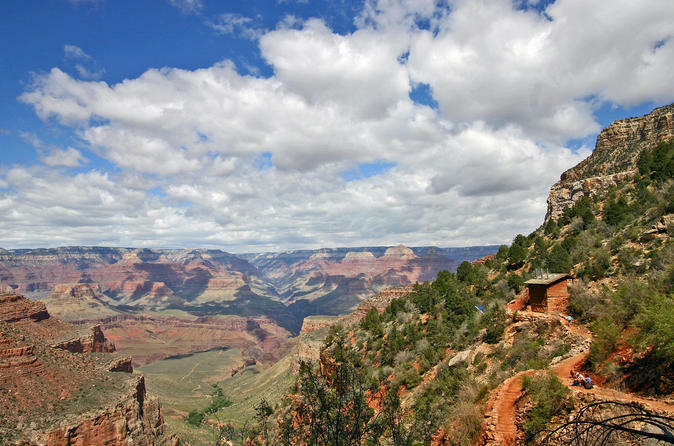 You will have the option to walk the 2.5 mile paved trail that allows you to walk from Grand Canyon Village to Mather Point where you can marvel at the breathtaking panoramic views of the canyon. Along the trail, enjoy the breeze through the Pinion and Juniper Pine trees as well as view earth's most mysterious and spectacular of landscapes - it's a place like nowhere else! Walk out onto the railed lookout and view Yavapai Point. From here, you can continue on the Rim trail and finish your hike before boarding the shuttle bus back to Grand Canyon Village. Your tour will also include stops along your journey at the Hoover Dam lookout point and Williams or Seligman on historic Route 66 in Arizona.